Circle of Willis: Bonus: David Sloan Wilson Interviews ME! Hey Everyone! This is not a full episode of my podcast Circle of Willis! Instead, this is bonus material related to Episode 10, where I talked with DAVID SLOAN WILSON. I say "related to" because really this bonus material is not stuff I cut from the original interview with David, as all the other bonus episodes have been. Instead, for this bonus episode, David Sloan Wilson is interviewing me! 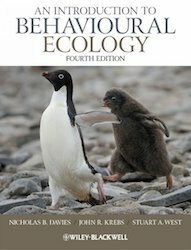 I'm thrilled to say he had so much fun chatting that he proposed this follow-up interview to learn more about my own journey to the field of Behavioral Ecology as a psychologist and neuroscientist. I was happy to tell him all about how the book An Introduction to Behavioural Ecology sort of changed my intellectual and scientific life, causing me to think very differently about my own work, but also about things like the evolution of the human brain, and about psychological science in general. I'm also grateful that this conversation gave me an opportunity to sing the praises of my friend and colleague Dennis Proffitt, whose work informs and inspires me all the time, and who was, for me, the "gateway drug" to ecological thinking. Anyway, I hope you all enjoy this as much as I did!